How to debug the VM? Hi. Whether you are experimenting and hacking in the VM (where it is likely that some things will go wrong) or you are running an application in production, it is always useful to know how to debug the VM. In this post, we will see how to compile the VM with all the debug information, how to run the VM from GDB (the GNU Project Debugger) and how to debug it using an IDE’s debugger. Before going further, I would like to tell you something I did last weekend (apart from sleeping quite a lot). Laurent Lauffont, creator of the PharoCasts, started a new sequence of screencasts called ” PharoCasts with Experts“. The idea is to do a more or less 1 hr “interview” about certain topic. Laurent calls by Skype to the “expert” and they can talk, ask questions, etc. Using TeamViewer, the “expert” shares his desktop to Laurent, who is in addition recording the screencast. The screencast is finally edited and uploaded to http://www.pharocasts.com . Ok, I am not a VM expert at all, but last week we did a 1:30 screencast about compiling and debugging the VM 🙂 This screencast contemplates all what we have learned in the previous posts and what you will learn today. In previous posts, I told you that Pharo guys recommend us to use the latest PharoCore for building the CogVMs. There are several reasons for this but the basic idea is that they want the VM can be build in latest versions, and if cannot, then fix it as soon as possible. But we have a much better testers than you, and it is called Hudson. So…I don’t want to force you to use the latest unstable PharoCore (which in fact, it is unstable sometimes). Even more, if you are starting in the VM world, I don’t want to add even more problems. So…from now onward, I have prepared and image so that you can use. At the time of this writing, there is no PharoDev 1.3 yet, but all the VM tools doesn’t load directly in a Pharo 1.2. There are 3 little changes that are needed. So…you can grab a PharoDev 1.2.1 and file in these changes, or directly load this image that I have prepared for you. This image has only those 3 changes. It does not contain any Cog or CMakeVMMaker package, that’s your homework 😉 The good news is that since we use a Dev image now we have all the development tools like refactorings, code completion, code highlighting, etc. When do we need to debug the VM? When there is a crash and you cannot find why it was. When you are developing something on the VM. I think most people will need the first one. If you are reading this post, you are probably a Smalltalker. 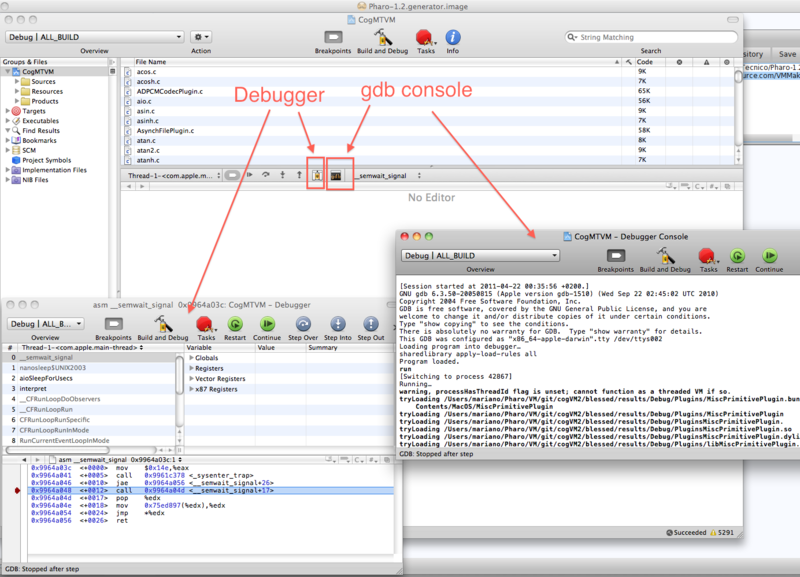 And if you are a Smalltalker, I know how much you love the debugger. We all do. But there are guys that are not as lucky as we are 😉 Now, being serious, how do we debug a program written in C ? I mean, the VM, at the end, is a program compiled in C and executed like any other program. I am not a C expert so I will do a quick introduction. When you normally compile a C program the binary you get does not contain the C source code used to generate such binaries. In addition, the names of the variables or the functions may be lost. Hence, it is really hard to be able to debug a program. This is why C compilers (like GCC) usually provide a way to compile a C program with “Debugging Symbols“, which add the necessary information for debugging to the binaries. Normally, as we will see today, these symbolic symbols are included directly in the binary. However, they can be sometimes separated in a different file. The GCC flag for the debugging symbols is -g where -g3 is the maximum and -g0 the minimal (none). There are much more flags related to debugging but that is not the main topic of this post. In addition to the debugging, a C compiler usually provides what they call “Compiler Optimizations”. This means that the compiler try to optimize the resulted binary in different ways: speed, memory, size, etc. When compiling for debugging it is common to disable optimizations, why? because, as its documentation says some variables you declared may not exist at all; flow of control may briefly move where you did not expect it; some statements may not be executed because they compute constant results or their values were already at hand; some statements may execute in different places because they were moved out of loops. The GCC flag for the optimization is -O where -O3 is the maximum and -O0 no optimization (default). But we are Smalltalkers, so much better if someone can take care about all these low-level details. In this case, CMakeVMMaker is that guy. As I told you in the previous post, there are several CMakeVMMAker configurations classes, and some of them are for compiling a debug VM. Examples: MTCocoaIOSCogJitDebugConfig, StackInterpreterDebugUnixConfig, CogDebugUnixConfig, etc. What is the difference between those configurations and the ones we have used so far ? The only difference is the compiler flags. These “Debug” VMs use special flags for debugging. Normally, these flags include things like -g3 (maximum debugging information), -O0 (no optimization), etc. For more details, check implementors of #compilerFlagsDebug. But…since there were a couple of fixes in the latest commit, I recommend you to load the version “CMakeVMMaker-MarianoMartinezPeck.94” of the CMakeVMMaker package. So…how do we build the debug VM? Exactly the same way as the regular (“deploy”) VMs (I have explained that here and here), with only one difference. Guess which one? Yes, of course, use the debug configuration instead of the normal one. That means that in Mac for example, instead of doing “MTCocoaIOSCogJitConfig generateWithSources” we do “MTCocoaIOSCogJitDebugConfig generateWithSources”. And that’s all. Once you finish all the build steps, you have a debug VM. What are you waiting? Fire up your image and create a debug VM 😉 Now…how do you know if you really succeeded or not to create a debug VM? Easy: it will be much slower and the VM binary will be bigger (because of the symbolic symbols addition). In a regular CogMTVM, if you evaluate “1 tinyBenchmarks” you may get something arround ‘713091922 bytecodes/sec; 103597027 sends/sec’ whereas with a debug VM something arround ‘223580786 bytecodes/sec; 104885548 sends/sec’. So..as you can notice, a debug VM is at least 3 times slower. Disclaimer: I am not a GDB expert, since most of the times I debug from the IDE (XCode). I will give you a quick introduction. So…we have compiled our with all the debug flags which means that the VM binaries now have extra information so that we can debug. GDB is a command line debugger from GNU Project and it is the “standard” when debugging C programs. In addition, it works in most OS. Notice that for Windows there are not VMMakeVMMaker debug configurations. I think this is just because nobody tried it. As far as I know gdb works with MSYS, so it may be a matter of just implementing #compilerFlagsDebug for Windows confs and try to make it work. If you give it a try and it works, please let me know! So far, I did a little test with some compiler flags like -g3 and -O0 and it compiles and runs. But (as we will see later) when I do CTRL+C instead of get the gdb prompt, I kill GDB heheheh. Googling, seems to be a known problem. Inspect the value of some variables and stack. Type “help data” and “help stack” in the gdb prompt. Put breakpoints in the code and then after go step by step. Notice that after doing the “kill” you can call “run” again an start everything again. Hopefully, you got an idea of how to debug the VM. However, using gdb from command line is not the only option. In the previous post we saw that CMake provides “generators”, i.e, a way to generate specific makefiles for different IDEs. Hence, we can generate makefiles for our IDE and debug the VM from there. Remember that executing “cmake help” in a console shows the help and at the end, there is a list of the available generators. In this particular example, I will use XCode in Mac OS. To do so, we need to follow the same steps than compiling a debug VM (that is, the same as building a release VM but using a debug CMakeVMMaker conf) but using the XCode generator in particular. That means that instead of doing “cmake .” we do “cmake -GXcode”. Notice that if we previously build another VM you will need to remove the CMake cache: /blessed/build/CMakeCache.txt. So.. External plugins are not correctly placed. I tried to fix it but I couldn’t. They are placed in blessed/results/CogMTVM.app/Contents/Resources/Debug but they should be together in blessed/results/Debug/CogMTVM.app/Contents/Resources. The problem is that when XCode compiles, it adds a “Debug” in the directory when compiling with the “debug target” and the same for “release”. I have spent two days completely trying to solve it from the CMakeVMMaker and I couldn’t. If you know how to do it, please let me know. Anyway, the workaround is to copy all those .dylib from the first directory to the second one. Now you are able to “Build -> Build and Debug – Breakpoints On”. If everything goes well, you should be able to open an image and the VM will be running with gdb. You will notice there is a little gdb button that opens a gdb console where you can do exactly the same as if it were by command line. 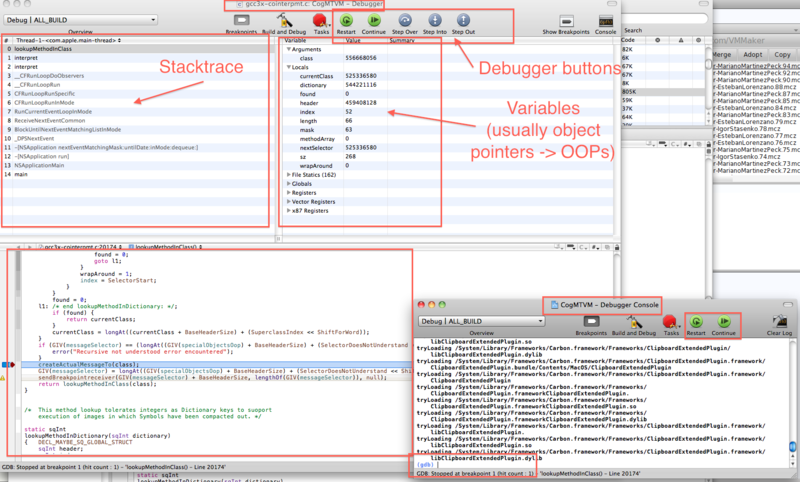 In addition, there is another button for the debugger. I attach a screenshot. So…there you are, you are running the VM in debug mode from gdb and inside XCode. Interesting things from the gdb console is that you have buttons for “Pause” (what we did with gdb but from command line with the CTRL+C) and for “Continue” (what we type from gdb command line). And you have even a “Restart”. 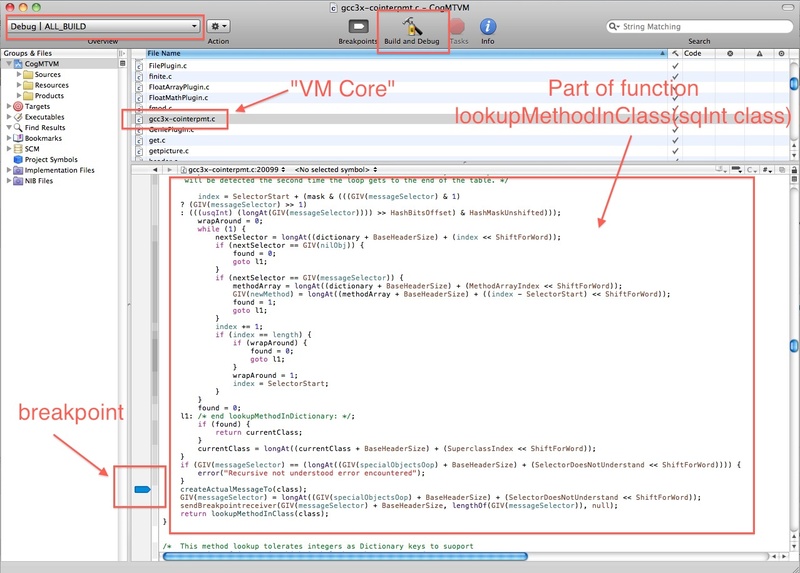 Now….the nice thing about being able to debug the VM with XCode is the ability to easily put breakpoints in the code. What where? in which file? Without giving much details (because that’s the topic of another post), we will say that the “VM Core” (basically Interpreter classes + ObjectMemory classes) is translated into a big .c file called gcc3x-cointerpmt.c (in case of cogMT). A regular CogVM will be called “gcc3x-cointerp.c” the same as for StackVM. You can check this files by yourself. You should know where they are. Remember? yes, they are (if you did the default configuration) in /blessed/src/vm (for Cocoa configurations it may be in /blessed/stacksrc/vm). In such folder you will see that there is another file cointerpmt.c (or cointerp.c). Which is the difference between the one that has the “gcc3x” and the one that has not? for me moment let’s just say the one with the “gcc3x” has some optimizations (Gnuifier) that were automatically done in the C code and with the intention of compiling such sources with a gcc3x compiler. There are much things I would like to talk about regarding debugging a VM, but the post is already too long and I think this is enough to start. I recommend you to watch the screencast. Further in this blog sequence, we will do a second part. Now, it is time to understand some internal parts of the Squeak/Pharo VM. This entry was posted on Saturday, April 23rd, 2011 at 5:57 pm	and tagged with build, CMake, Cog, compiling, Debug, GDB, Git, XCode and posted in Uncategorized. You can follow any responses to this entry through the RSS 2.0 feed.